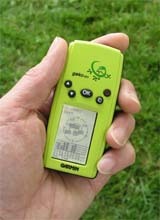 The Garmin Geko 201 GPS receiver is one of the least expensive handheld units available. The Geko line of receivers was introduced in the Spring of 2003 and includes the 101, 201, and the 301. The lime-green 201 is quite small, but it gives you a lot of bang for the buck. All necessary information is on five main display screens called ‘pages.’ They are: Satellite page, Map page, Navigation page, Trip Computer, and Menu page. The Satellite Page shows (in animation) the satellites, satellite signal strength, and the estimated location accuracy. There are two display options on the Satellite Page, Normal Skyview and Advanced Skyview. The Advanced Skyview page displays the numbered satellites the unit is using, their proximity to your current position, and their individual signal strengths. The Map Page shows where you’ve been, displays waypoint names and symbols, and shows where you’re going. The map can be oriented Northward so that the top of the map is always north, regardless of your direction of travel or ‘Ahead,’ which means the map will rotate so that the destination is always in front	of the person icon that represents the user. Auto Zoom will automatically adjust the scale so that your entire trip fits on the screen. Otherwise, you can manually choose the scale with the ‘up’ and ‘down’ buttons. The scale goes from 50 feet to 800 miles. The Pan Track Log will let you move the pointer to any location on the track to set waypoints, to start ‘goto,’ or start a ‘tracback.’ As you pan the track, the times display to show when you were at a particular point. Tracback is used to guide you to return on the same path left behind. Goto points you to the shortest distance to any chosen waypoint. The Navigation Page uses a compass (the compass only works when you’re moving) to show your moving direction and speed. If you’re moving toward a specific destination, it shows the name of the location, the distance and time to go, and displays a direction arrow in the compass ring. The Navigation Page can display 10 types of data: elevation, heading, location, speed, time/date, trip odometer, arrival time, bearing, final	distance, and time left to go. The Trip Computer Page displays four fields of your choosing. You can make choices from 31 different items, such as elevation, speed, sunrise and sunset, current time, bearing, destination point, and estimated time of arrival. The Menu Page is the access point for all the unit’s features. From the Menu Page, you can change the longitude/latitude, elevation, and choose waypoint names and symbols. Tracks and routes are managed here. This is also the place from which you can access the four games. The time can be displayed in 12 or 24 hour time. You can choose between 12 different position formats (longitude/latitude, UTM, etc.). You can also choose map datum, units of measure (nautical, statute, metric), and north reference (true north, magnetic north, grid, and user). The backlighted display timeout can be changed here (15, 30, 60, 120 seconds) and so can the display’s contrast. The input/output lines on the Geko 201 allow an interface to a wide range of external devices, including PCs, differential beacon receivers,	marine autopilots and / or a second GPS receiver. he Geko 201 is a sharp-looking little receiver, if you like its chartreuse color. It’s small – less than 4 inches long. This makes the screen rather small, but since the Geko 201 can’t support maps, this isn’t a concern. What is a little bit of a problem is sometimes the small characters can be hard to read. The placement of the five buttons on the face of the unit are easy to access. There is a rubber strip around all sides where the front and back meet. This gives a good feel and a good grip. The battery cover on the back also has a rubber pad attached – good for staying put on the dash of a car. The manual says to allow 15 to 30 minutes for the unit to track satellites when turned on for the first time. My Geko 201 took 5 minutes and 55 seconds to get a first-time fix. Subsequent cold starts were about 40 seconds. The first test was to take a 1.5 mile walk around the neighborhood. I marked and named waypoints at significant locations and doing so was easy. Estimated location accuracy displayed was as low as 15 feet at times. In a second test I marked a waypoint at my beginning location and then after walking some distance, I used the ‘Goto’ feature. After choosing my destination (the beginning location) the pointer accurately told me which way to turn. The unit showed how far it was to the destination in miles. Below one-tenth of a mile, the unit displays that distance in feet. When I reached my destination, the Geko 201 was off by only 18 feet out of a one-mile walk. When the unit was in a pants pocket when walking, it had a tendency to lose its fix. Using the optional belt clip allowed it to maintain an adequate signal. An even more reliable way is to attach it to a shoulder strap of a daypack or backpack. Under moderate foliage the Geko 201 showed some signal degradation, but still held its fix fairly well. Compass was off slightly on my test unit. The Geko 201 is easy to use, small, and inexpensive. It does a lot for the price and makes for a great entry-level GPS receiver. Comparing it to the Garmin eTrex, if you can afford a little more money, you’ll get many more features with the 201.